Some of you may know Rob Draper from our first artist collaboration, “Hope & Dream.” Or you may know him from his infamous Starbucks coffee cup drawings. Rob is a very talented lettering artist from the UK, specializing in hand lettering for branding and identity, editorial, large scale works, retail and apparel. He had the pleasure of tagging some restrooms and painting a few murals at Hanbao, a local UK cocktail bar and burger joint owned by three brothers living in the UK with roots in Hong Kong and heavily influenced by the US street culture. Can you walk us through the interior of the space? The decor has an almost cold gritty feel of concrete, neon and black throughout with premium minimal furniture, a very modern urban industrial feel yet in a really old building. 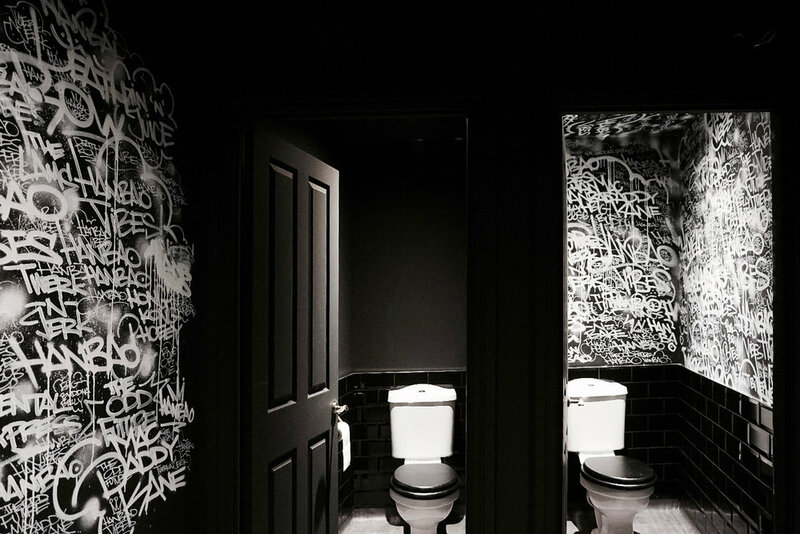 I liked the concept of this contrast which led us to come up with the various pieces- heavy amounts of ‘tagging’ in one toilet cubicle with the rest completely spotless and the contrast of colours - white for the ladies and copper for the mens. The flourishes and detail from the “All Beef, No Drama” piece were directly illustrated from the 100 year old stone work around the front windows. The “Cash Rules Everything Around Me” piece was painted above a vintage safe that was in the building with the Supreme cro-bar mounted on top of it, highlighting the overall theme of subtle references to music and street culture throughout. How long was this project? Tell us about your prep time and process. I worked onsite for around 3 - 4 weeks. The murals across the restaurant spaces are a range of various sizes. 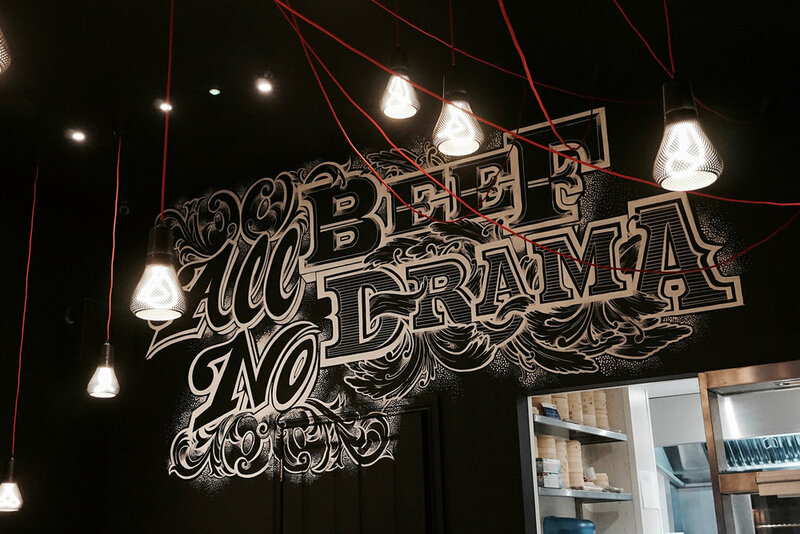 The “All Beef, No Drama” piece is possibly the largest, which is around 18 ft. by 8 ft. and actually began as a limited edition screen print. The prep time was a lot of meetings and coffees coming up with the concepts themselves. I was very lucky to find that ‘sweet spot’ where the clients were open to, and encouraged creative concepts throughout. I didn’t really have a specific process. There were so many different styles and sizes that a catch-all process just wouldn't really work. The only consistent aspect is that the concepts were hand drawn and presented to the client beforehand. Then it’s a case of working backwards and trying to work out how to actually make it happen. What tools and paints did you use on this project? Mainly the Molotow All-For-One system in pens with brushes and aerosols which guaranteed a consistent color through different lines and scales. What was the most challenging component? I guess the most challenging component is knowing where to stop. Especially with the tagging approach, it’s easy to do more and more but that would completely destroy the contrast concept. Too little and the customer doesn’t really pick up on it, too much and the impact is lost. How long have you been painting murals? How did you get into it? I caught the first wave of graffiti art in the UK from age 11. Then went to Art College for three years and University for another three. I got a degree in Visual Communication and then worked as a Magazine Designer, Graphic Designer, Senior Creative, Creative Director and then Art Director before becoming a freelance designer. Mural requests have been cropping up over time, from one-shot sign writing enamels to marker pens and aerosols. It complements my other lettering work and I love doing it so I am more than happy when these requests arrive. If you haven’t seen it yet, check out Goodtype’s limited edition print collaboration with Rob Draper. $1 of each sale goes to support the Stay Sharp Scholarship, and 50% goes directly to the Artist. Rob Draper has worked with clients such as The Golden Globes, Nike, Gap, Pentagram, Harper & Collins and The Washington Post to name a few. Visit Rob at robdraper.co.uk or on his Instagram at @ropdraper1 to see more.